We may be one small step closer to "first contact" with extraterrestrial life. 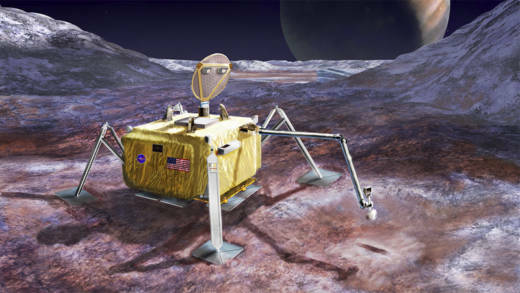 On February 7, scientists delivered a report ordered by NASA detailing the feasibility and potential scientific value of sending a robotic lander to Jupiter's ocean-bearing moon, Europa, to search for signs of life. This would be only the third solar system moon on which we have landed, following earlier missions to Earth's own moon and to Saturn's liquid-hydrocarbon bearing satellite, Titan. Unlike those two, however, Europa may harbor an environment friendly to life as we know it on Earth. If approved by NASA, it would be the first life-detection mission since the Viking landers looked for evidence of microbial life in Mars' soils back in the late 1970s. Other mission goals include analyzing the composition of surface materials to assess the habitability of Europa and to probe the structure of the frozen crust, information that would inform future missions exploring the moon's ocean. Ever since photos taken by Voyager 2 in 1979 suggested the presence of a deep ocean of liquid water beneath Europa's cracked icy surface, Jupiter's moon has become the most tantalizing body in the solar system in the search for extraterrestrial life. 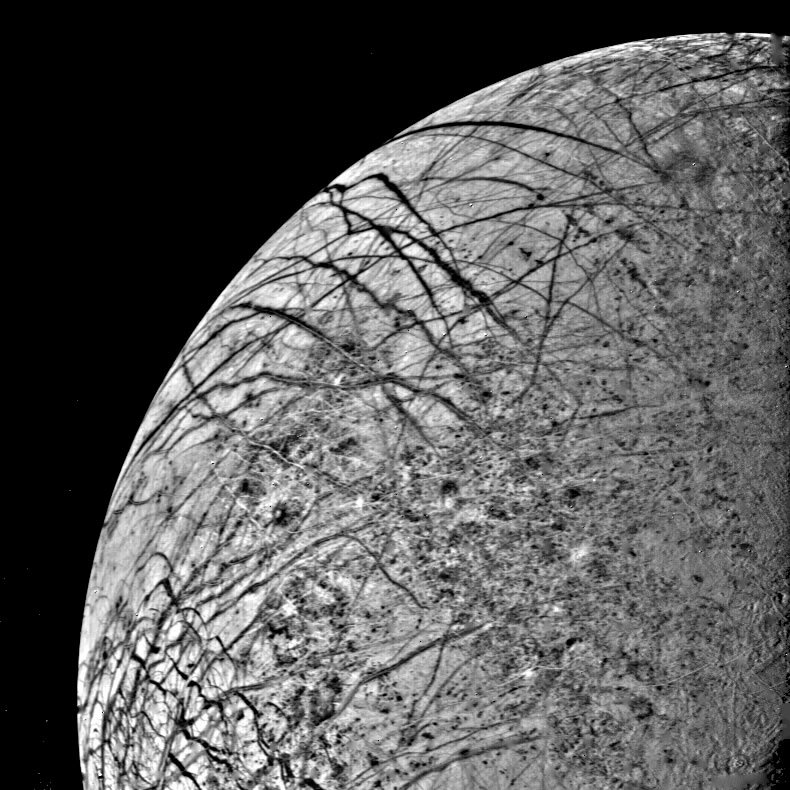 Europa's ocean has made its presence known not only by cracks in the icy crust. In 2014, the Hubble Space Telescope first detected water vapor plumes erupting from below Europa's surface that are believed to be supplied by that ocean. Also, in the early 2000's the Galileo spacecraft measured disturbances in Jupiter's magnetic field caused by Europa, and the nature of those disturbances suggest that its ocean waters are likely salty. 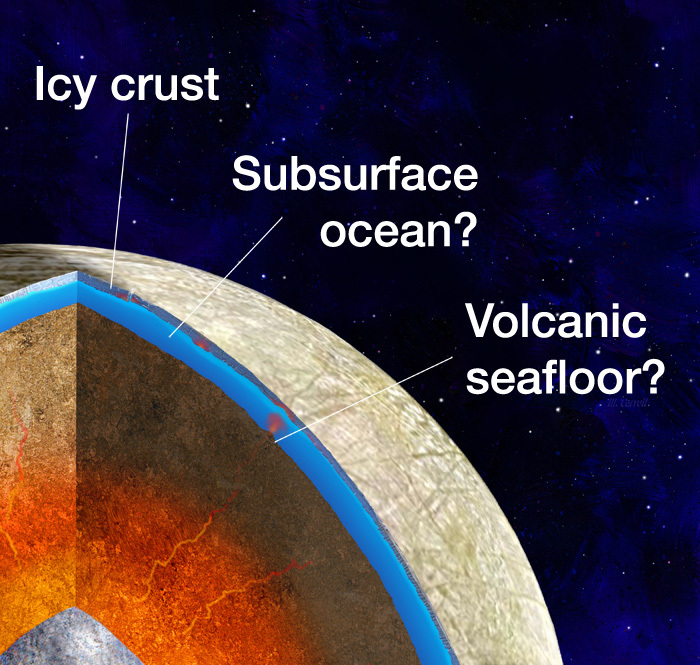 Our current interpretation of the evidence tells us that Europa's ice crust may be only a few miles thick, and floating on top a salty global ocean as deep as 30 miles and containing twice the amount of water in all of Earth's oceans. Even more enticing for astrobiologists looking for extraterrestrial life, Europa's ocean probably sits on top of a rocky sea floor. If so, then heat from the moon's interior may emerge through hydrothermal vents, supplying energy and chemicals to create an environment suitable to support some form of life. Similar geothermal vents on Earth's ocean floor support thriving communities of marine life that depend solely on energy and chemicals from Earth's interior, without any need for sunlight. Though we have found sub-surface bodies of liquid water in several solar system objects, only those of Europa and Saturn's moon Enceladus are believed to be in direct contact with a rocky ocean floor. While scientists consider the new study, a separate NASA mission, the Europa Mission, is already in development and expected to launch sometime in the early 2020's. The Europa Mission spacecraft will make multiple close passes of Jupiter's moon, analyzing the structure and composition of its icy crust, the interaction between Europa and Jupiter's magnetic field, and possibly "sniffing" the chemical makeup of the water vapor plumes erupting from Europa's southern region. In his novel, "2010: Odyssey Two," Arthur C. Clarke landed a fictitious Chinese spacecraft and its human crew on Europa, though with a different mission goal in mind. The novel's Chinese explorers made moon-fall simply to fill their ship's propellant tanks with water in order to continue their journey. In that case, humans didn't find life on Europa; it found them. Their adventure ended when huge tentacle-like vines emerged from a crack in the ice to pull the doomed ship into the dark, watery depths below. It's too early to peg any dates for a landing on Europa. NASA is at the earliest conceptual stages for such a mission. As a next step toward deciding how, or if, to proceed, NASA will ask for input from scientists in meetings planned for early this spring. How to land a spacecraft on a moon with no atmosphere and mostly unexplored terrain, and what kinds of scientific instruments it should carry, are some of the questions that will be explored. 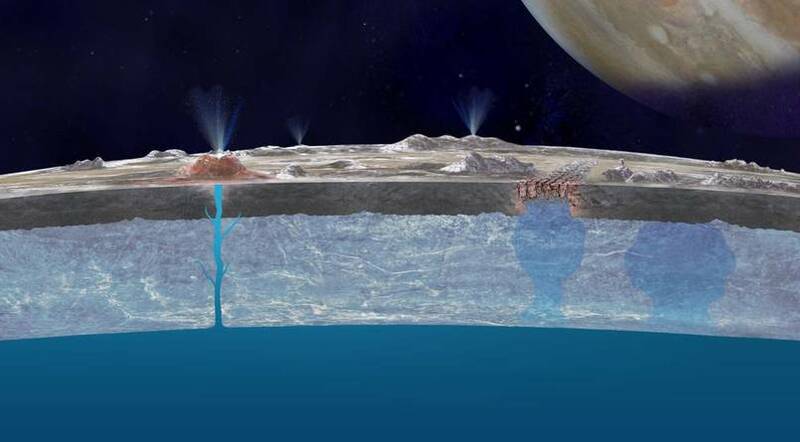 Since Europa is such a promising place to look for extraterrestrial life, landing a spacecraft there is a next logical step in a series of missions to scrutinize the ice-crusted moon and the mysterious, potentially life-bearing ocean it possesses.